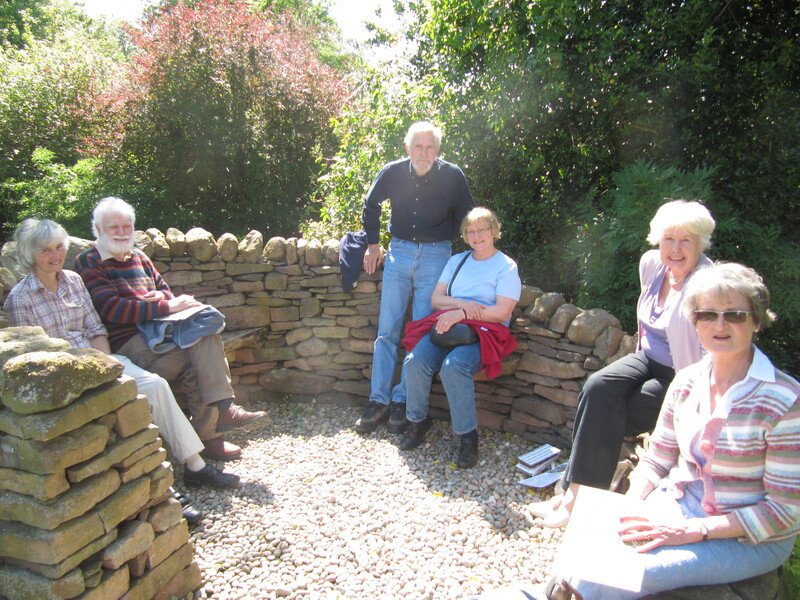 You see us in the ‘sitootery’ at Shepherd House in Inveresk on a lovely sunny day. We were delighted with this gem of a garden. Not so big as to be remote from our own experience but so exquisite. Charles and Ann Fraser have lived there for 53 years and their love of gardening and sense of design just shines. 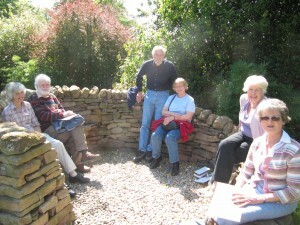 There are lovely pictures of it on their website at http://www.shepherdhousegarden.co.uk/about.html You can see some of the features which we admired. The low espaliered crab apples making a fence which looks like rubies in the autumn. The lavender rill with lovely fountain. The veg patch in raised beds made of willow wattle. Much better pictures than mine. We then went over the road to visit the National Trust gardens of Inveresk House. Those who had been before were pleased to see that it being taken care of rather better now. It has a lovely framework of trees and shrubs but more work and a wonderful prospect looking down towards the river. We discussed this while we enjoyed the sunshine in the ‘sitootery’. We agreed that we should not be too ambitious and some members wondered who would use the garden. I have since met with Rosemary Rogers who did a lot of work and thinking about the garden a couple of years ago before her husband became very ill. She has agreed to source some bedding plants just to fill the front of the raised bed for the summer. Then, in the autumn (between October and December), we should get some new compost to fill the front of the raised bed and plant it up with small herbaceous perennials and herbs which will fill it and be easy care. I then spoke to librarian, Julia Cormack, to follow up her idea that the back of the raised bed should be made suitable for a buggy park (It is totally under the shelter of the porch roof so not suitable for planting) She will ask the council to provide some weed suppressing membrane and pebbles and and edging to deal with this area. She assured me that on sunny days, library users do go out into the garden, for example to sit and read the newspapers there. Rosemary is also willing to continue to take a regular interest in the upkeep of the garden, keeping an eye on things. I think this will work as I do have three people willing to help occasionally and once it looks a bit better perhaps more will be willing to help with the upkeep. Wednesday 22nd June from 6.30 p.m. Our visit to Falcon Bowling and Tennis Club. 84, Newbattle Terrace. We have been invited by John Chalmers, club member who looks after the garden. He says the roses will be at their best then. Sunday 3rd July. Grange Association coach trip to Craigieburn near Moffat. Contact Judith Reeves 667 5570 or plants@grangeassociation.com for details. Saturday 23rd July. 10.30 a.m. we are invited by Alison Cunningham to come for a ‘take us as you find us’ visit to her garden at 7, Lauder Road.